× 4 = eight Required Please enter the correct value. No Airbnb IPO date has been set, but already the company may be worth as much as $24 billion. Airbnb is an online rental service that allows homeowners to list their properties for short-term stays. The service is available in more than 190 countries. More than 35 million guests have used the service since its founding in 2008. The site also has more than 1.2 million listings. Unfortunately, the new funding means we'll likely see another delay in the Airbnb IPO date. I say unfortunately because Airbnb's growth has been astounding. According to The Journal, Airbnb representatives said they expect $900 million in revenue for 2015. In 2013, the company had revenue of just $250 million. By 2020, they expect revenue of $10 billion. The company is projected to have earnings of more than $3 billion at that point. Compare that to one of the world's largest hospitality companies, Priceline Group Inc. (Nasdaq: PCLN). Priceline has a market cap of $60 billion and expects revenue of just $9 billion this year. Airbnb's growth should only continue as we head toward its IPO date. "We're still very much in the early days of travelers being aware of and considering Airbnb for their next trip," Lodging Advisors LLC's Sean Hennessey told The Journal. "They could achieve a sizable amount of market share as the market grows and as their mind-share grows." In April 2014, Airbnb was valued at just $10 billion. 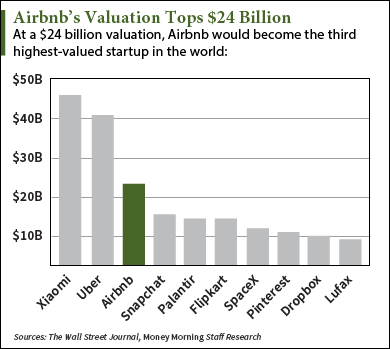 At $24 billion, Airbnb would be the third highest-valued startup in the world. Airbnb still isn't profitable and expects a loss of $150 million in 2015. But that's common among tech IPOs. Investors and institutional buyers will buy in because of the revenue and user growth. Very well done and informative article it is very well done and informative.